Have you ever realized that you like a particular food in one form but not in another? For instance, I eat oranges all the time but I don’t care much for orange juice; I find grapes perfectly pleasant but I generally avoid raisins (there are only two recipes on this site that involve raisins, and one of them calls for them in chocolate-covered form); and for years, I adored pickles but couldn’t stand fresh cucumbers. Almonds are another example. When it comes to eating whole nuts, almonds are one of my least favorite—I had the same bag of almonds in my freezer for about the first four years of grad school—but I absolutely love sliced almonds, almond butter, almond extract, etc. 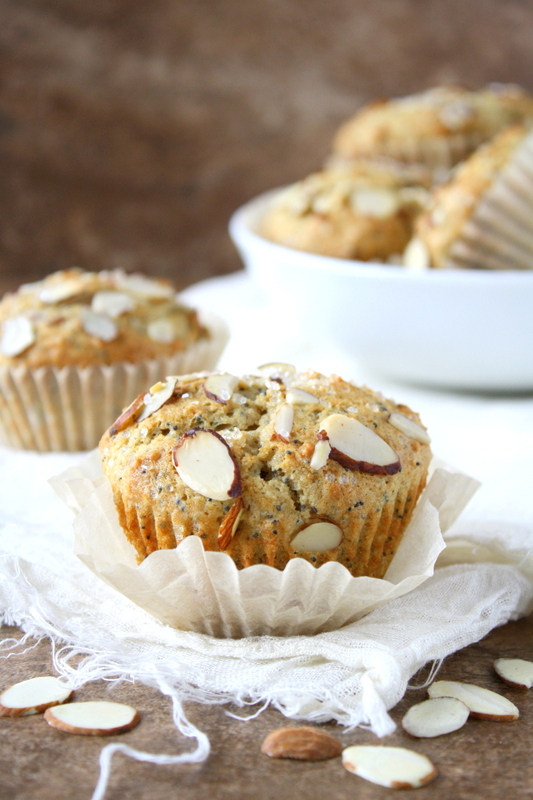 Costco muffins are a rare treat in my household, but I’m head over heels for the almond poppy seed ones. One time, I was planning to buy a variety of Costco muffins to bring to an event, and the night before going to the store, I had a dream that I got there and they were all out of the almond poppy seed ones. I awoke with a feeling of distress…which was shortly followed by a feeling of sheer ridiculousness. I mean, it’s probably not normal to stress-dream about baked good shortages, right? Since I seldom buy Costco muffins, I wanted to create a similar homemade (and more moderately sized) version. 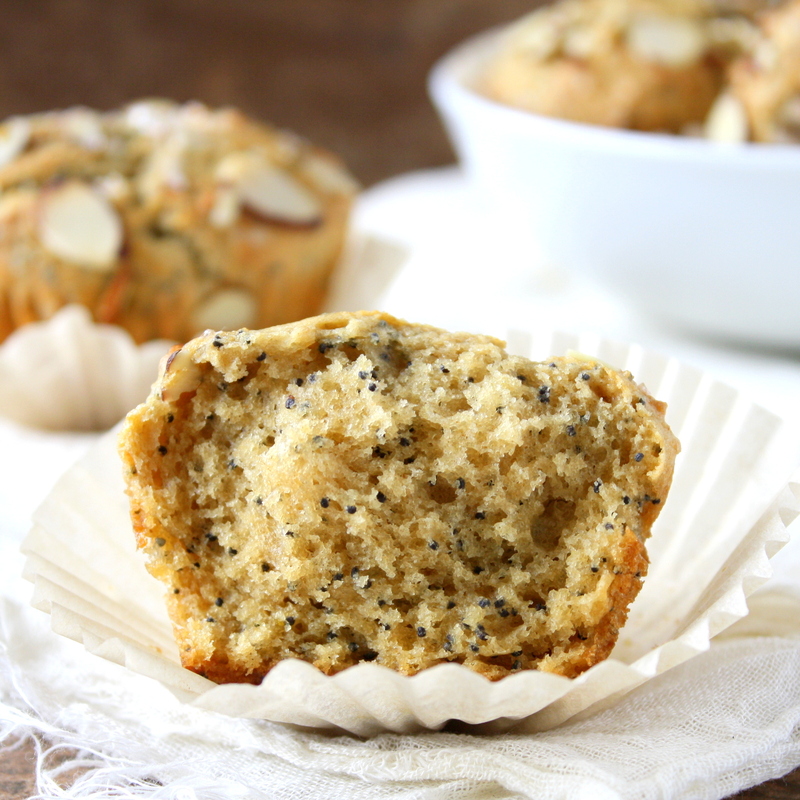 While I haven’t managed to exactly replicate the indulgently cake-like texture, these almond poppy seed muffins are a real treat nonetheless: the flavor is intensely almond-y with added nuttiness from the poppy seeds, the crumb is rich and delicate, and the top offers a delicious moment of crackly crispness before giving way to the soft interior. The Costco ones don’t have sliced almonds or sanding sugar on top, but I find that they add such a nice finishing touch (both visually and texturally) that it’s worth the extra step. Are there any foods that you like in a certain form but dislike in others? Have you ever craved a particular food item so much that you dreamt about it? Please tell me I’m not the only one! Preheat the oven to 375 degrees. Grease and flour a muffin tin or line with paper liners. In a large mixing bowl, combine the sugars and beaten egg. Stir in the melted butter, sour cream, and almond extract. In a separate bowl, combine the flour, baking power, baking soda, salt, and poppy seeds. Add the dry ingredients to the mixing bowl and mix until just combined. Add the heavy cream and stir gently to incorporate. Portion the batter into the muffin tin (you should get about 12 muffins). Optional: sprinkle sliced almonds and sanding sugar on top. Bake for 13-15 minutes or until the tops are golden and an inserted toothpick comes out clean. Let the muffins cool in the pan for 5 minutes before transferring to a wire cooling rack. Serve warm. Store in an airtight container in the refrigerator for up to 1 week. 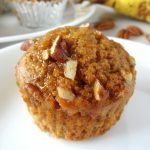 I've also made these muffins with slightly less sugar (1/4 cup sugar, 1/4 cup packed brown sugar); they are still delicious, but a little less similar to their Costco counterparts. If you prefer a muffin that is lighter in color, replace the brown sugar with an equal amount of white sugar. 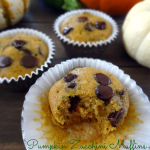 I’m sharing this post at the following link parties: Recipe of the Week, The Wednesday Showcase, Welcome Home Wednesdays, and Fiesta Friday (cohosted by Indian Curry Shack and La Petite Casserole). OMG I haven’t thought about Costco muffins in YEARS! I remember disliking the chocolate ones (the only time I’ve ever not liked something chocolate) and loving the almond poppyseed. Thank you for making a more normal-sized version for us! No Costco?! That’s rough. I have actually never tried their coffee cake, but I’m glad that you’ve developed a copycat homemade version – I have a hard time justifying buying any type of baked goods from Costco for such a small household! And would you believe that I *just* bought sanding sugar for the first time a week or two ago? I’m pretty much in love with how crunchy and sparkly it is. I bet these are even better than the Costco ones Mara! They look delish. Wish I had one right now with my afternoon cup of coffee! Thanks, Mary Ann! 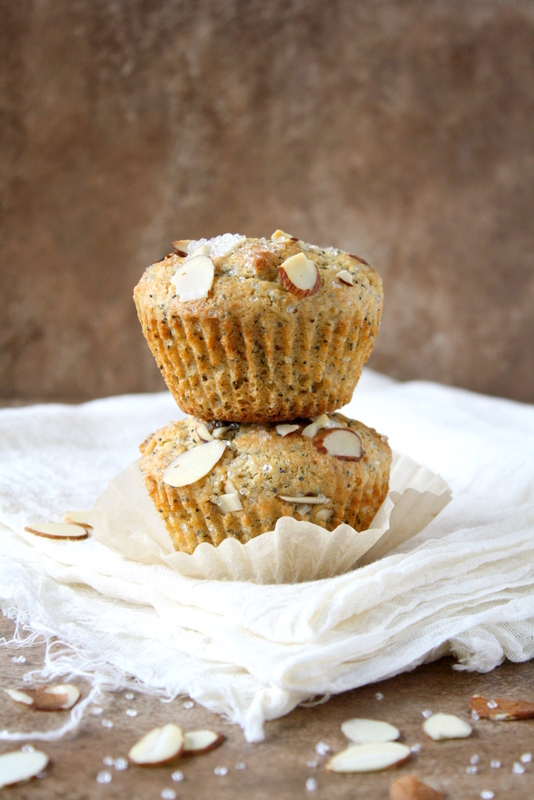 Coffee + a muffin sounds like a delightful afternoon treat! Yep I agree, these are probably better than Costcos even though for such a large operation they do a great job. I love the nice crunch to added to the top of these beauties too Mara! Thanks, Julie! I really love the addition of the sliced almonds and sanding sugar on top. I didn’t do that for the first batch, and it seemed like something was missing! Indeed, I’ve been eating them for dessert more often than for breakfast! Thanks, Monika! 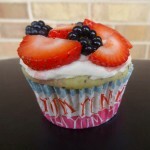 I wish to have one of these muffins tmw for breakfast! Thanks a lot for being at FF this week! Thanks, Margherita, and thank you for hosting! That’s interesting about hot chocolate – but I suppose the flavor is somewhat less concentrated, usually. And no kidding about the storm! We had some intense lightning and near flash flooding at one point. That muffin was so good! It absolutely made for a great beginning of our break. These muffins look so spongy and have risen so well! 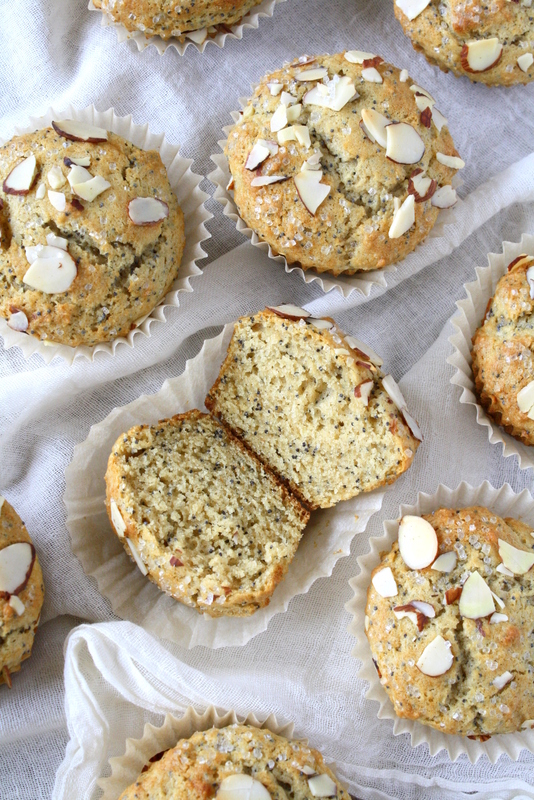 I’m sure with the addition of almond and poppy seeds these must be tasting divine. Thanks for getting these to the party! Complete pleasure! 🙂 I’m scared i’ll put on extra pounds just by looking at all the delicious food at the party. Oh my. You had me at “almonds.” Also, “poppy seed.” 😉 Sour cream in the batter sealed the deal. So glad I stopped by from Welcome Home Wednesdays! Hi Elizabeth! I’m so glad you stopped by. I hope you get a chance to try these sometime! 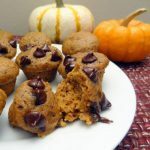 These look delish – came across you via recipe of the week linky- on my list to make! I love using sanding sugar on muffins too. I love love the sound of these muffins. It adds such a nice finishing touch that I can’t believe I haven’t used it before! Thanks so much for stopping by, Zainab! Thanks, Rachel! I only recently came around to liking almond butter, but now I’m hooked! Haha, I am on the exact same page as you with the oranges vs orange juice. I have bought poppy seeds a long time ago, but haven’t used them yet! This needs to happen in my house! !